Digging – Call 811 First! 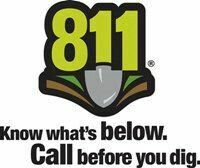 A new, federally-mandated national “Call Before You Dig” number, 811 was created to help protect you from unintentionally hitting underground utility lines while working on digging projects. People digging often make risky assumptions about whether or not they should get their utility lines marked due to concerns about project delays, costs and previous calls about other projects. These assumptions can be life-threatening. Every digging job requires a call – even small projects like planting trees or shrubs. If you hit an underground utility line while digging, you can harm yourself or those around you, disrupt service to an entire neighborhood and potentially be responsible for fines and repair costs. For more information go to http://call811.com/before-you-dig/do-i-really-need-call. If you dig without using the “one call” service and you damage any underground utility lines, state law allows the utilities to triple the charges to you for repair work. So make that call! Don’t forget—no posters or notices are allowed on utility poles! Both city and state law prohibit posting on poles according to RCW 70.54.090. Staples and nails cause safety hazards, and crews have to spend time removing them before they can work. Our time is your money! If power lines are above or below the place that you have selected for a tree, choose a dwarf or low growing variety. Don’t plant shrubs or trees next to power poles. If we have to work on the pole, the tree will be removed and will not be replaced. Don’t put ivy growing up poles. It is a hazard to our crew and promotes rotting and decreases the life of the pole. Have a 10-foot “clear zone” around it. Avoid planting next to pad-mount transformers, and keep landscaping rocks and fences away. If they are too close, they might be damaged when it is serviced or replaced. Keep the door area clear, it must swing open for service.